My nephew Sam was born the same year we opened the first Grand Central Bakery in Portland. 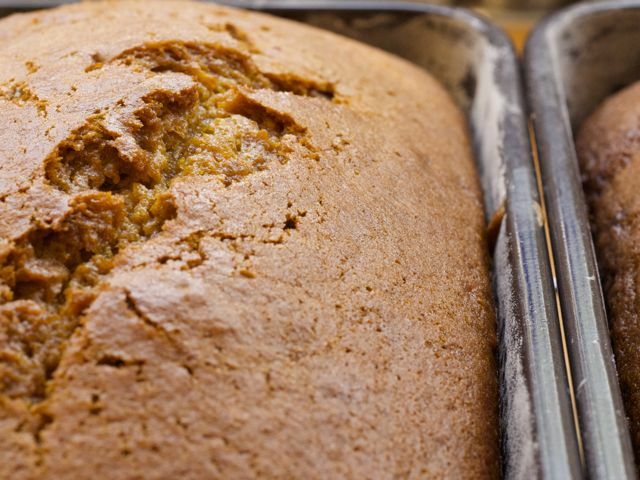 This pumpkin bread was one of his early solid foods — he would toddle into the bakery and ask for it by name. Today, he is a strapping 14-year-old, and despite the extensive display of delicious treats he can choose from when he visits his dad at work, he goes for the pumpkin bread 99 percent of the time. This sweet, fragrant bread stays moist for days. Prepare to bake: Preheat the oven to 350 degrees. Lightly grease and flour two 9-inch-by-5-inch loaf pans. Combine the dry ingredients: Measure the flour, baking soda, salt, and pumpkin-pie spice into a bowl and whisk to combine. Combine the oil, sugar, and pumpkin: Using a stand mixer with the paddle attachment, mix the oil, granulated and brown sugars, and pumpkin purée on medium-low speed until well blended, about 2 minutes. Add the eggs: Crack the eggs into a liquid measuring cup and whisk together. With the mixer on low speed, slowly pour in the eggs, incorporating each addition completely before adding the next. Scrape the bottom and sides of the bowl. Alternate additions of the dry and wet ingredients: Add one-third of the dry ingredients and mix briefly on low speed, then add the water. Mix well and repeat, using half of the remaining dry ingredients and all the buttermilk. Add the remaining dry ingredients and mix just until combined. Scrape the sides of the bowl and then divide batter between the prepared pans. Bake: Bake for 60 to 75 minutes, rotating the pans every 20 minutes or so. The loaves should be dark golden brown with cracked tops, and a skewer inserted in the center should come out clean. Pumpkin-Pie Spice: Combine ¼ cup cinnamon, 2 tablespoons ground ginger, 1 tablespoon ground nutmeg, 1 tablespoon ground cloves, and 1 tablespoon ground allspice in a small bowl and stir with a fork until well combined. Store in a cool, dry place for up to 3 months. Culinate editor's note: You can replace the canned pumpkin purée with 15 ounces of mashed roasted pumpkin.